Image caption The surprise ruling from John Bercow, Speaker of the House of Commons, is the top story for many papers, after he said MPs would not be able to vote again on the PM’s same Brexit deal. The Daily Telegraph says Remain voter Mr Bercow has faced “repeated accusations of anti-Brexit bias”. The paper leads on comments from the Solicitor General Robert Buckland, who warned there is now a “constitutional crisis”. Image caption The Guardian also leads on Mr Bercow’s announcement, which it says has brought “constitutional chaos” and means Theresa May is likely to have to go to the EU summit on Thursday and ask for a long delay to Brexit. Meanwhile, the head of the Environment Agency has warned that England is likely to run short of water within 25 years because of a rising population and drop in water supply because of climate change. Image caption Tuesday’s Financial Times describes Mr Bercow’s ruling as a “potentially insurmountable hurdle” to the PM’s Brexit plans, and said it had “infuriated” Downing Street. Mrs May had been considering a third vote on her Brexit deal – which has been rejected twice – but Mr Bercow’s ruling will make it “much harder” for her to do so, the paper says. Image caption The Daily Mail gives over most of its front page to a picture of Mr Bercow which, the paper says, shows his “smirk” as he delivered his “bombshell”. The paper adds that he has now been accused of “trying to sabotage Brexit” and offers the extra detail that the delay that Mrs May could ask for from Brussels could be up to 20 months. Image caption The accusation that Mr Bercow is “sabotaging” Mrs May’s Brexit deal comes from Number 10 itself, the Times reports. According to the paper, Downing Street warned that Mr Bercow was “bent on softening Brexit”, and a government source accused him of conspiring with MPs who want to seize control of Brexit. Image caption The Daily Express’s headline calls Mr Bercow “The Brexit Destroyer” after his statement, which he based on a parliamentary rule dating from 1604. The paper describes the Commons speaker’s decision as “extraordinary” and said it had “enraged” ministers. Image caption The Sun is brazen in its criticism of Mr Bercow, claiming that he “stuck two fingers up to 17.4 million Brexit voters” and calls his move a “huge blow” to hopes of an exit on 29 March. 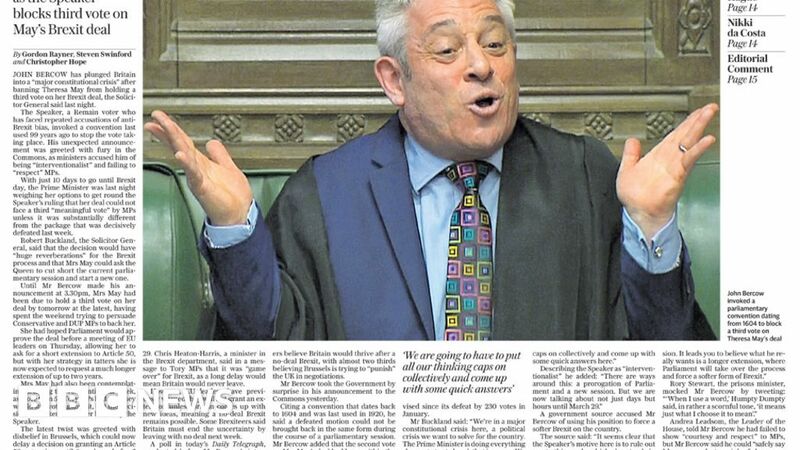 The paper’s headline – “B*ll*cks to Bercow”, complete with its own asterisks – refers to the wording of an anti-Brexit car sticker which the paper claims was in a car belonging to Mr Bercow’s wife. Image caption The Metro also leads on Mr Bercow. The paper says the PM was “caught on the hop” by the Speaker’s statement, quoting a PM spokesman who said there was no forewarning. The main photo on the front page is from the scene in the Dutch city of Utrecht following a deadly shooting. The paper includes an inset picture of the suspect. Image caption Meanwhile, up to 30 Conservative MPs have told Mrs May that they will only support her Brexit plan if she promises to resign as PM, the i newspaper reports. The paper says the “ultimatum” was given by Eurosceptic MPs, as she tries to gather more support for her Brexit deal. The paper quotes one source as saying that the backbench MPs made clear that “to get her deal we need her head on a plate”. Image caption The Daily Mirror focuses on claims concerning Universal Credit, the government’s new benefits system which is gradually being rolled out. Frank Field, who chairs the Work and Pensions Committee, said the committee will investigate claims that women are being forced into prostitution to survive. Image caption The Daily Star reports on the court conviction of a 19-year-old for assault. The teenager, Arron Scholes, is the son of former footballer Paul Scholes, and was found guilty on Monday of assaulting his ex-schoolfriend, the paper says.